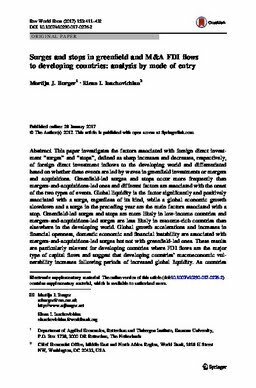 This paper investigates the factors associated with foreign direct investment “surges” and “stops”, defined as sharp increases and decreases, respectively, of foreign direct investment inflows to the developing world and differentiated based on whether these events are led by waves in greenfield investments or mergers and acquisitions. Greenfield-led surges and stops occur more frequently than mergers-and-acquisitions-led ones and different factors are associated with the onset of the two types of events. Global liquidity is the factor significantly and positively associated with a surge, regardless of its kind, while a global economic growth slowdown and a surge in the preceding year are the main factors associated with a stop. Greenfield-led surges and stops are more likely in low-income countries and mergers-and-acquisitions-led surges are less likely in resource-rich countries than elsewhere in the developing world. Global growth accelerations and increases in financial openness, domestic economic and financial instability are associated with mergers-and-acquisitions-led surges but not with greenfield-led ones. These results are particularly relevant for developing countries where FDI flows are the major type of capital flows and suggest that developing countries’ macroeconomic vulnerability increases following periods of increased global liquidity. As countries develop they typically become more exposed to merger-and-acquisition-led surges, which are more likely than greenfield-led surges and stops to be short-lived and associated with domestic macroeconomic policies.